Traditionally influenza vaccine produced from chick embryos grown in the vaccine strains. But for many reasons, chick embryos are not the best substrate for the production of influenza vaccines. After the outbreak of "bird flu" in the world have begun to develop production technology of influenza vaccines in cell cultures using a medium that does not require addition of animal serum. The composition of such media are usually kept secret. In Russia’s own serum-free culture media and malosyvorotochnyh not. And the expensive imported counterparts. Natal’ya Mazurkova developed a unique environment in which, instead of animal-origin components used vegetable components, in particular soybean flour. This medium can be used in malosyvorotochnom version by growing the cells in serum-free version — if the service life of vaccine viruses. Established Koltsovskaya virologist growing medium is superior foreign counterparts. French powder, from which you can make a liter of culture medium, costs 4,000 rubles. Liter of medium, the composition of which is designed to "vector", costs 550 rubles. Abroad medium in liquid form can be used only for 3 to 4 months, since prolonged storage therein precipitate appears. Koltsovskaya medium can be used throughout the year by making the amount of vaccine that is required at the moment. Since 1999, the agencies that control the production of pharmaceuticals, vaccines, called for the removal of components of animal origin. Biologists believe that at this time known to mankind, only 10% of the existing virus, so the vaccine with components of animal origin, even after the passage of the strictest controls may contain viruses unknown to science. In plant components also have a virus, but for the people they are not dangerous. If Russia does not produce its own growth medium for the production of culture vaccines in the event of an influenza pandemic we have to buy it abroad. It is highly probable that the required number of the suppliers will not be. Therefore, domestic biotechnology companies interested in buying medium from Russian producers. The company "Microgen" is the largest enterprise of the Russian healthcare industry, has ordered a "vectors" 50 liters of liquid medium for research. Koltsovskaya scientists interested in developing and All-Russian Research and Technological Institute of Biological Industry of Moscow, the city Schyolkovo. 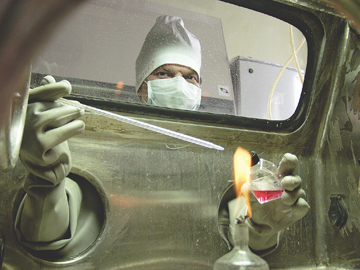 Work on developing a serum-free medium was carried out in Koltsovo for fifteen years. March 1 by the results of their research Natalia Mazurkova defended by "vector" doctoral thesis "Development and use of herbal drugs in the influenza vaccine technologies create" specialty "biotechnology". Virologist Natalia Mazurkova working head of the laboratory preparations of natural origin in the department of prevention and treatment of especially dangerous infections, "Vector". In the near future begins production of a new environment for the company "Microgen".